The reality in 2009 is that the House of Commons as a meaningful political institution, an effective legislature, had been in decline for some decades and was close to reaching the point where it had become, to distort Walter Bagehot slightly, a dignified part of our constitution without much actual dignity. The House appeared to be little more than a cross between a rubber stamp and a talking shop which had taken to collective activity such as the imaginative interpretation of what might be a legitimate expense claim as much as an odd form of displacement activity as out of any shared sense of malice or corruption. ..Parliament appeared to have been reduced to the status of a small green room in which men, overwhelmingly men, shouted at each other for relatively short periods of the working week and then disappeared from sight thereafter to do Lord Knows What. Certainly, it was not to strike terror in to the hearts of Ministers or offer considered criticism and surgical scrutiny either of proposed legislation in the chamber or via the Select Committee system of the implementation of executive policy. ..it is manifestly the case that the House of Commons has proved a much more interesting institutional creature in this Parliament than has been true for some time and most learned commentators on these matters, and even the lobby, have noticed this. Far from being in the final twitches of our mortal life, the virtual corpse has staged an unexpected recovery. It turns out that in the spirit of Dr Who the parliament elected in 2010 has not been about death but about regeneration. The House of Commons is not only capable of making the news but of influencing the political weather. ..The House Business Committee has yet to arrive despite its place in the coalition agreement of May 2010 and the Procedure Committee has recently highlighted deficiencies in the means by which Private Members’ Bills become law (or, more accurately, do not) which is plainly an area where the House is entitled to a discussion, a debate and a decision, whatever it ultimately determines to do. He held a private meeting with the Speaker in his apartment, even though he apparently does not regularly have such meetings. He claims he did not attempt to influence the Speaker in favour of his amendment, but refuses to tell the press or public what they did discuss. The perception is certainly one of collusion, if not of conspiracy to thwart Brexit, but Speaker Bercow is impervious to criticism and probing points of order. It isn’t quite ‘La constitution c’est moi!‘, but he certainly disregards precedent where he wills and change procedures as he wishes, apparently oblivious to the implications of the constitutional precedents he is setting. The British constitution is based on four things: statute law, common law, works of authority, and Parliamentary conventions. These conventions exist for a reason. They’re unwritten understandings about how something in Parliament should be done which, although not legally enforceable, until now has been almost universally observed. To the public, process is arcane, boring, and sometimes incomprehensible. But given that we lack a written constitution, it is important, and Parliament must be conducted in a manner which is recognised and respected. Recently the Speaker, the chief officer and highest authority in the House of Commons who is expected to remain strictly impartial, has attracted much controversy with his interpretation of Parliamentary rules. Now the floodgates have opened, and we have several amendments being put down by a range of characters seeking to delay, obstruct and even sabotage Brexit. Amendments put down by Yvette Cooper, Dominic Grieve and Nick Boles would do enormous damage to the constitution of the UK by taking control away from the Government and damaging any government’s ability to govern for years to come. These MPs are trying to upend centuries of UK constitutional and Parliamentary traditions as they attempt to defy the referendum. This desperate move would fundamentally change the job of Parliament and pit it against the people. And today he is omnipotent. As parties try to whip their MPs to support this or that amendment to avert ‘no deal’ by pausing Brexit or thwarting Brexit or ditching the backstop or extending Article 50 or holding indicative votes to see where a parliamentary majority may lie, the truth is that many of these will not be voted on: Speaker Bercow alone will decide which amendments will be debated in the Chamber. The shape of Brexit is for him to mould. Indeed, the entire future of Brexit today rests in his hands. If he (again) selects Dominic Grieve’s amendment, the Remainer Speaker will gift a Remainer Parliament the opportunity to take back control from a Government which can’t quite decide if it is for leaving or remaining. If ‘no deal’ is removed from the equation, what possible incentive is there for the EU to concede anything on Brexit at all? 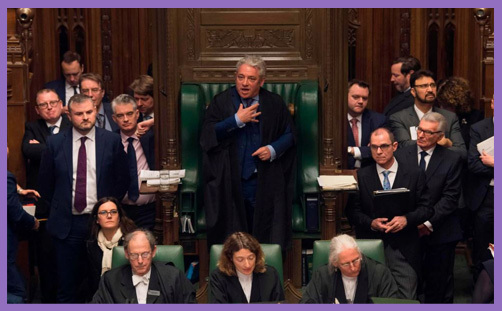 The problem is that Speaker Bercow is no longer impartial: his private interests and prejudices are steering the nation away from the possibility of a clean, global Brexit (ie ‘no deal’) and he is seemingly oblivious to his use or abuse of power. He might kneel next to his Chaplain as she prays this prayer, but he has lost all sense of transcendence and ultimate reconciliation. His zeal for reform in earthly politics has blinded him to the meagreness of his achievement and the transience of his personal agenda. His own political will alone guides him in the choice of today’s amendments: he is accountable to no one. His planning is his morality. We might pray that he acts wisely and justly, but there is a foreboding sense that we are about to witness the turbulent claims and counter-claims of political might, constitutional tradition and democratic vengeance competing with each other, extended to breaking point by a Speaker who is more concerned with his own survival than the survival of democratic political authority in the nation.